Recombinant protein fragment, corresponding to a region within amino acids 214-489 of Human MMP19 rasi6 (UniProt ID: Q99542). H1299, HCT116 and MCF7 cell lysates; Human hepatoma tissue. Our Abpromise guarantee covers the use of ab154496 in the following tested applications. 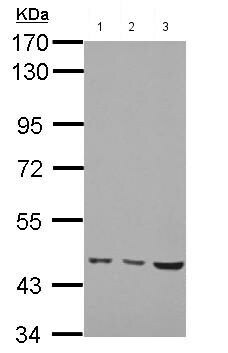 Endopeptidase that degrades various components of the extracellular matrix, such as aggrecan and cartilage oligomeric matrix protein (comp), during development, haemostasis and pathological conditions (arthritic disease). May also play a role in neovascularization or angiogenesis. Hydrolyzes collagen type IV, laminin, nidogen, nascin-C isoform, fibronectin, and type I gelatin. Expressed in mammary gland, placenta, lung, pancreas, ovary, small intestine, spleen, thymus, prostate, testis colon, heart and blood vessel walls. Not detected in brain and peripheral blood leukocytes. Also expressed in the synovial fluid of normal and rheumatoid patients. Note=May play a role in pathological processes participating in rheumatoid arthritis (RA)-associated joint tissue destruction. Autoantigen anti-MMP19 are frequent in RA patients. Activated by autolytic cleavage after Lys-97. 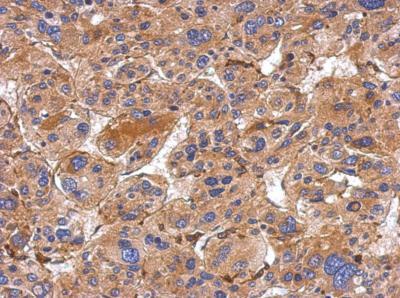 Immunohistochemical analysis of formalin fixed, paraffin embedded Human hepatoma tissue, labeling MMP19 rasi6 using ab154496 at a 1/500 dilution. ab154496 has not yet been referenced specifically in any publications. Publishing research using ab154496? Please let us know so that we can cite the reference in this datasheet. There are currently no Customer reviews or Questions for ab154496.